Properties in Auvergne-Rhône-Alpes average 4.6 out of 5 stars. Gite in the heart of the gorges of the Ardèche. Property 12: Gite in the heart of the gorges of the Ardèche. Property 16: Wooden cottage for peaceful holidays with pool to share. Charming stone house with pool, 4 pers. 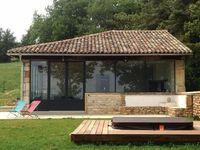 Property 34: Charming stone house with pool, 4 pers. A beautiful and unique apartment. The owner and apartment were both charming. I had everything I needed for a relaxing visit to the Ard&egrave;che region including a full kitchen,comfortable bed, large bathroom and a terrace with a breathtakingly beautiful view. I wouldn&rsquo;t hesitate to recommend this place to a friend or stay there again. Great views and location in Beaujolais! One week in this beautiful little house was perfect to experience all the near region has to offer. 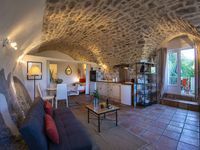 Easy access to Lyon living on the crest, surrounded by amazing vineyards and villages of character. Wonderful place to cook with local ingredients, drink Beaujolais wines and soak up the morning sunrise.